The southbound lane of traffic is currently 40′ wide. The target lane width for a main street is 10′. Much has been said about Chicago’s desire to raise revenue and increase safety on City roads by installing speed cameras at parks and schools around Chicago. Though this maybe a short term fix, I argue here that poor roadway design encourages speeding and gives drivers the opportunity to take risks to pursue the fastest route. Striping a bike lane on southbound Kedzie, 50′ north of Belmont and connecting it to the existing bike lane south of Barry. 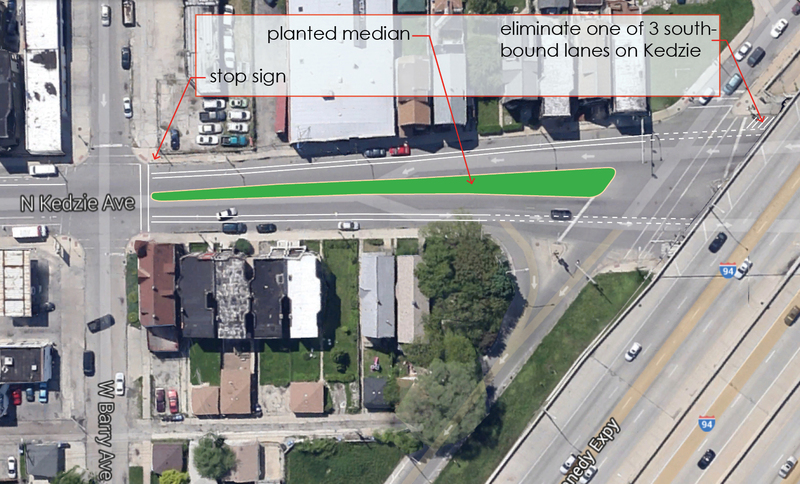 Constructing a planted median on Kedzie south of the Expressway to reduce the road width, slow traffic, and make it easier to cross the street at Barry. Pigeon proofing the viaducts above the sidewalk and regularly cleaning the sidewalks. No one should have to walk here in its current condition. Fixing the potholes! It’s dangerous for bicyclists and annoying for drivers. Sidewalk is covered in pigeon excrement and is not ADA compliant. Below is a concept for a new median on Kedzie, which would calm traffic and make it easier to cross Kedzie at Barry by creating a protected refuge in the middle of the street. Potential Planted Median and Bike Lane along Kedzie; Increases safety and beautifies this gateway to Logan Square. Recently, concrete forms have been added underneath the bridge along Belmont which eliminate the space where the homeless people camped. These ‘anti-homless’ barriers prevent people from sleeping there, but they also create a sidewalk which is not visible to the street. 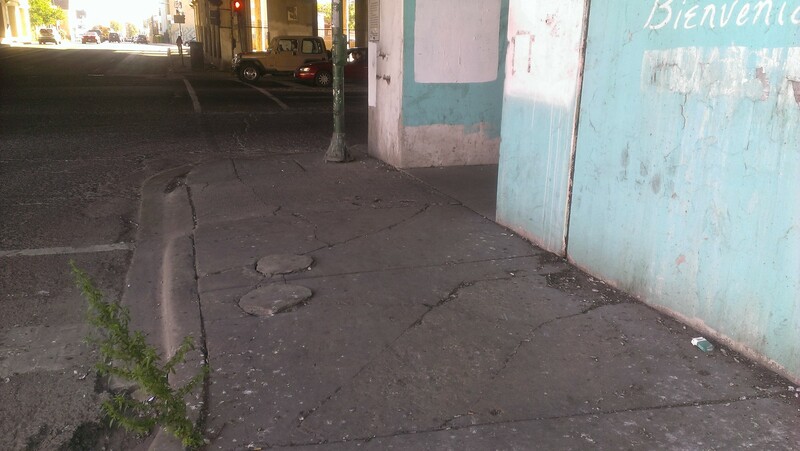 Because it is now a secluded space, it may increase the risk of attacks along this sidewalk. See this article in DNAinfo. 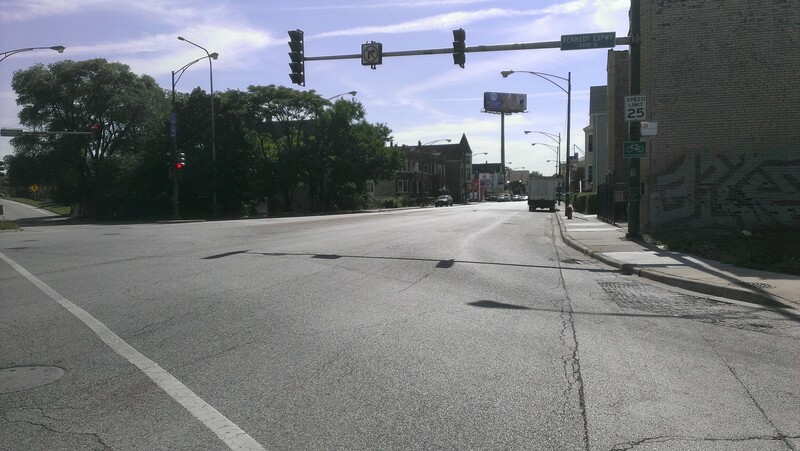 Alderman Mell has recently indicated that TIF funds will be used to create buffered bike lanes along this stretch of Kedzie which BWLS greatly supports. We recommend making the street safer for pedestrians as well. This would be a tremendous improvement. As a Logan Sq resident, I used to dread biking under the highway due to the problems you mentioned in this post. Walking under the Belmont/Kedzie Kennedy Overpass is my least favorite thing to do in Chicago. I despise biking there, too. The darkness, pigeon excrement, crazy driving, and small sidewalks all contribute. I’m just trying to get to Aldi… instead I usually go to the Aldi in Wicker Park, over three times further away. any thought of using the extra width of the road to accommodate parking protected bike lanes and pedestrian refuges to narrow the crossing width even further?